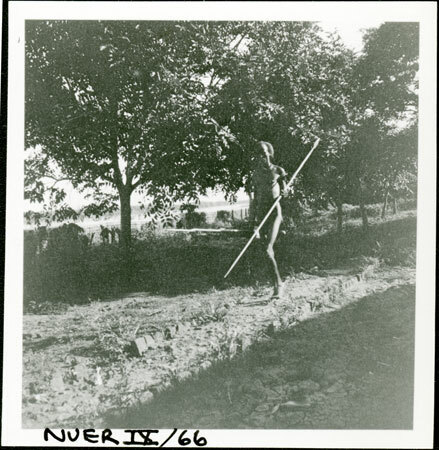 A man carrying spears and an ambatch shield and wearing what could be a Chief's Police badge on his left shoulder, walking along a stone-lined path next to the Sobat River at Nasir. The native police force was recruited from 1927 to assist with the enforcement of judgements made at local chief's courts, which were also augmented at this time, a policy forcefully pushed through by C. A. Willis who became governor of Upper Nile Province in 1926. Note on print reverse ms pencil - "28 2 A210" & print front border ms ink - "NUER IX/66"
Morton, Chris. "Nuer man on path" Southern Sudan Project (in development). 03 Jan. 2006. Pitt Rivers Museum. <http://southernsudan.prm.ox.ac.uk/details/1998.355.430.2/>.